In this April 4, 2019 photo, Stephen Fonseca, right, gives a community leader guidance on handling the dead in Magaru, Mozambique. In this April 4, 2019, photo, Stephen Fonseca, a forensics expert who tries to find and name the dead, recovers a piece of clothing during a search for bodies in a field of ruined maize in Magaru, Mozambique. 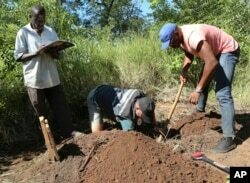 In this April 5, 2019, photo, Stephen Fonseca, center, places a bag with a spine into a small grave as Chief Moses Mukoto, left, writes the time of day in a notebook in Magaru, Mozambique.